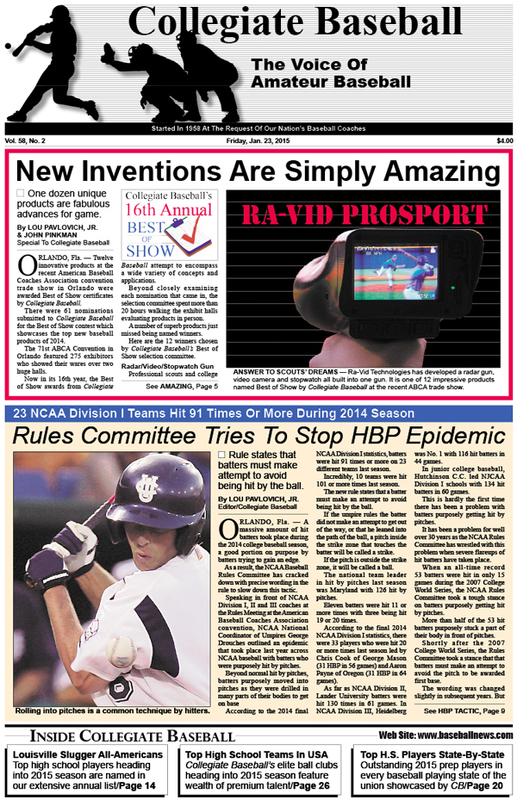 • 16th Annual Best Of Show: Top 12 inventions at the recent American Baseball Coaches Assn. Convention in Orlando are revealed with prices, warranties and what makes them so special for baseball. • Special in-depth story: How the NCAA Rules Committee will try to stop the hit by pitch epidemic. • Louisville Slugger Pre-Season High School All-American Team complete with stats. • Louisville Slugger Pre-Season High School All-American Second team, complete with stats. • In-depth look at the top 30 high school teams in the nation entering 2015 season led by defending national champion Lambert H.S. (Ga) which rolled to a 36-2 record last season. • Top 2015 high school players in every state are listed in special rundown. • Ruleball with Rich Marazzi: Wrong call made when ump rules third base runner out. • Complete coverage of the American Baseball Coaches Association Convention in Orlando. • Two special photo pages of the recent ABCA Convention which hit all the memorable moments. • Justin Dehmer column: When players make extra effort, it can pay off big. • Pat Williams explains importance of top coaches in sports and what separates them. • Vito Friscia, a 6-foot-3, 225-pounder from Valley Stream Central H.S. (Valley Stream, N.Y.) captures Power Showcase world championship in Miami, Fla.
• Jack Dunn presents his thoughts on what runners should do out of box..
• Charlie Greene explains priorities needed on first and third plays. To purchase the Jan. 23, 2015 edition of Collegiate Baseball, CLICK HERE.